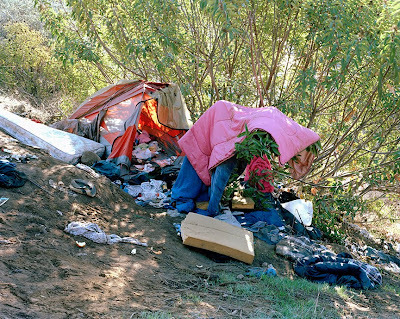 Investigating "some of the problems and paradoxes within the structure of contemporary American society, and the ideologies of freedom and advancement on which it was founded", Ben Murphy's Homeless Encampments of the American West depicts the temporary shelters of 'homeless' individuals who have taken up semi-nomadic residence in California and Nevada. 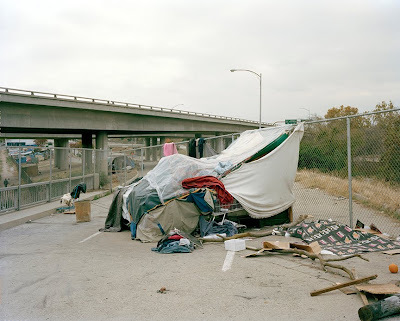 These ad-hoc living spaces which seem to inhabit the 'wastelands' on the periphery of the city, are in a sense sculptural representations of a facet of the American psyche and, an evocative twist of the idea of the American 'settler'. Murphy writes: "With limited resources in insecure environments, a sense of home and identity is achieved and established through an improvised impermanent architecture. 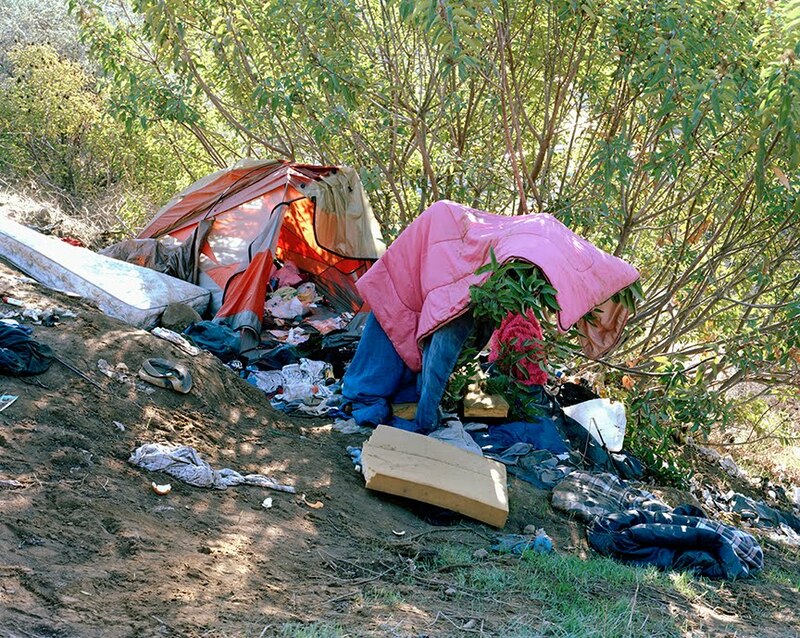 American homeless settlements exist as ghettoized counter cultures; often neglected, and marginalized by the communities they live amongst, identifiable by the dwellings made from found materials, vehicles, tents and the remnants of peoples pasts, as much as by the inhabitants themselves. Hidden in woodlands, under freeways, and on embankments, or more conspicuously sited on roadsides, in industrial areas, public spaces and wasteland these liminal environments rarely exist for more than a few days or weeks before they disappear to leave the traces of an existence." Ben Murphy's career initially began with a BA in Graphic Design at Northumbria University, and, after years spent working as a musician, actor, assistant designer to Neville Brody and a stint as assistant art director for Face Magazine, Murphy settled on photography. It seems the choice was well made. 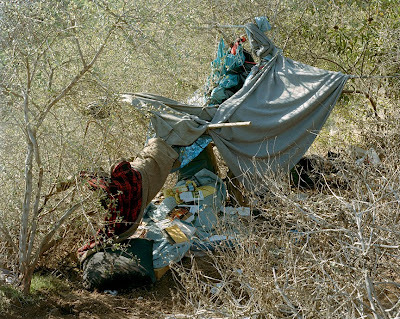 Murphy has since exhibited widely, and is held in permanent collection at the V&A and the National Portrait Gallery and has held shows at The Courtauld Gallery, Plymouth City Art Gallery, and Steiglitz19. He has also been featured in publications such as Portfolio, The Telegraph Magazine, The Sunday Times,Wallpaper, The Independent and published The U.N Building with Thames and Hudson in 2005.